'Brother Carl' (Lloyd Zurbrigg, R. 1983). Seedling# P 69 W. TB, 36" (91 cm), Midseason bloom and rebloom (late July-October in Virginia). White; pale yellow beard tipped blue. 'Sister Helen' X 'I Do'. Avonbank Gardens 1983. From AIS Bulletin #249, April 1983 Introducing BROTHER CARL- 12 to 14 weeks of bloom here in Virginia! Heavily substanced white. Fertile both ways. (Sister Helen X I Do). $50.00. Avonbank Iris Gardens. 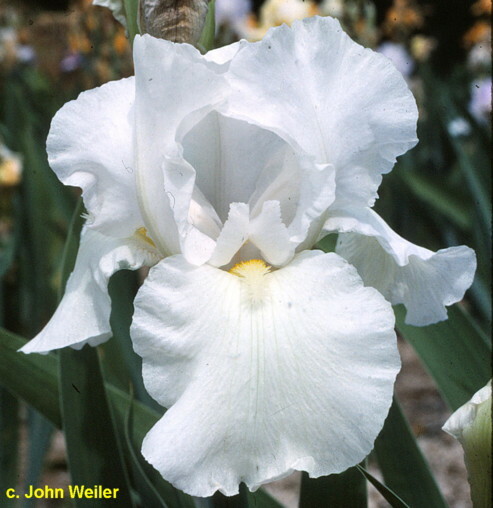 From Moonshine Gardens catalog, 1989: BROTHER CARL ('83 Zurbrigg) 36" M. White with pale yellow beards, they're tipped blue when the flowers first open. One of my favorite rebloomers. It gives loads of rebloom here year after year often starting during the summer and blooming steadily 'til the weather turns cold enough to stop it. This is pretty much typical of its performances around the rest of the country also. Very good branching and nice flowers with good substance. Its flowers aren't quite as good or ruffled as most of the latest oncers but there are only a few other rebloomers with as much quality that also are as vigorous and as strong, early and reliable with their rebloom nationwide. Its pollen is very potent and I've been using it a lot. Has given lots of very vigorous seedlings here that start blooming early in the summer and some have had very modern, heavily ruffled flowers. $6.50.